The U.S. Supreme Court on Monday declined to take up Texas’ effort salvage its strict voter identification law, handing at least a temporary victory to civil rights advocates who have successfully argued that the law discriminates against minorities. The U.S. Supreme Court on Monday declined to take up Texas’ effort to salvage its strict voter identification law, handing at least a temporary victory to civil rights advocates who have successfully argued that the law discriminates against minorities. But Chief Justice John Roberts said Texas could later try another appeal — after a lower court rules whether state lawmakers discriminated on purpose when they passed the law in 2011. “Petitioners may raise either or both issues again after entry of final judgment,” Roberts wrote Monday. Texas Attorney General Ken Paxton said he was "disappointed" that the high court would not immediately hear the case. But, he added in a statement, Roberts made it "very clear" that an appeal request would be "even stronger" after the lower court resolves lingering questions. The court’s decision comes as voting rights experts are waiting to see if President Donald Trump’s administration will reverse the federal government’s opposition to the Texas law. 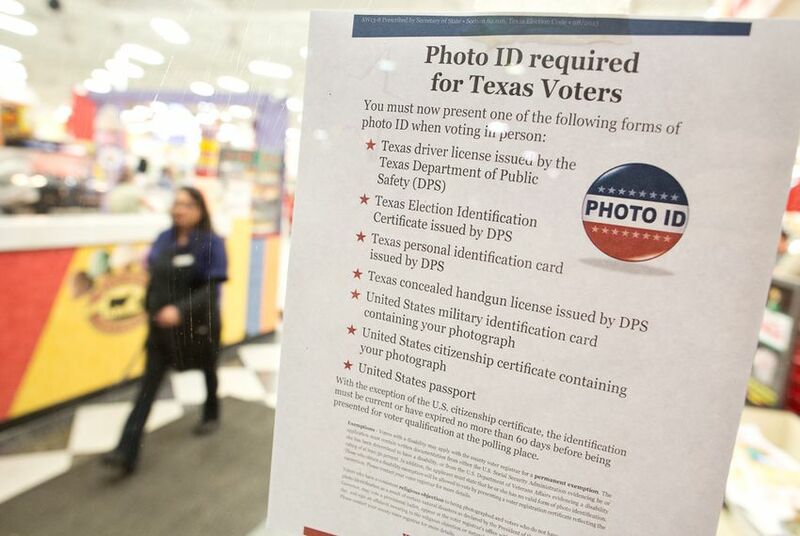 Last July, the U.S. 5th Circuit Court of Appeals ruled that Texas' 2011 voter ID law discriminated against minority groups, who were less likely to possess one of seven accepted types of identification. Those include: a state driver's license or ID card, a concealed handgun license, a U.S. passport, a military ID card, a U.S citizenship certificate or an election identification certificate. The Texas law violated the federal Voting Rights Act, the appeals court ruled. That court did not wholly strike down the law, but ordered a lower court judge — Nelva Gonzales Ramos, of Corpus Christi — to draw up a temporary fix for last year’s elections. She temporarily softened the rules, allowing folks without photo identification to vote if they presented an alternate form of ID and signed a form swearing a “reasonable impediment” kept them from obtaining identification. The appeals court also told Ramos, who previously ruled that Texas intentionally discriminated in drawing up the law, to reweigh the evidence on that question. Experts have testified that more than 600,000 Texans lacked identification required by the 2011 law, though not all of them have necessarily tried to vote. Texas officials say the voter ID law bolsters the integrity of elections by preventing voter fraud, which Gov. Greg Abbott has called "rampant." But the U.S. Department of Justice (under President Obama) and other plaintiffs — backed by court rulings — have pointed out that in-person voter fraud is incredibly rare. Texas had spent about $3.5 million litigating the case as of last April. "We will continue to fight for the law in the district court, the Fifth Circuit, and if necessary, the Supreme Court again," Paxton said Monday. The Supreme Court’s decision came days after the Trump administration requested a delay in the lower court proceedings, which fueled speculation that his team could switch the federal government's side in the battle, joining Texas leaders in defending the law. On Friday, Ramos granted Trump’s request to delay a hearing originally scheduled for Tuesday until Feb. 28 as the new administration settles into office.